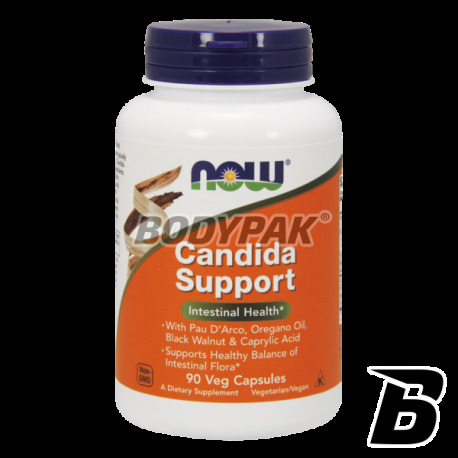 Health & BeautyNOW Foods Candida Support - 90 kaps. NOW Foods Candida Support will help you maintain a healthy digestive system. To full health it requires more than just a refined diet. In case of bacterial imbalance in the body is not functioning. Microflora must be properly developed and balanced. Candida Support is an advanced formula that was created to help your body. In extreme cases, an unbalanced microflora of the digestive system can lead to the development of excess yeast (in both women and men). NOW Foods Candida Support may be the solution to your problems - and still do not know it. The natural origin of the formulation makes it absolutely safe but also very effective in operation. Life is too short to waste it on bad mood and fight with your own digestive tract - bet on quality and comfort! NOW FOODS CANDIDA SUPPORT YOUR WAY TO HEALTH! Składniki: sproszkowana cebula czosnku (Allium savatiu), sproszkowany liść oliwki (Elea europea), Koci Pazur (Czepota puszysta), bylica piołunu, dwutlenek krzemu, stearynian magnezu, celuloza oraz żelatyna jako składnik otoczki.